Despite the religious prohibition on the making of images, medieval Islamic taste shows a definite tendency towards zoomorphism - the transformation of functional objects into animal forms. Studies of medieval European bronze water-pouring vessels have shown the lion, horsemen and griffin forms most commonly encountered can be traced back to Near Eastern, Islamic metal prototypes. Surviving ceramic examples from the Islamic world include a group of three Syrian thirteenth century fountain-heads, a sphinx, a griffin and a horseman, and a number of pouring vessels from Iran, including oxen and seated lions. 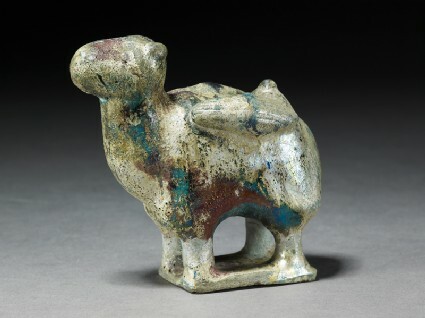 The small camel illustrated here appears to have been purely ornamental, as is a fine white-glazed figure of an ox from Syria (Victoria and Albert Museum) and a series of medieval Persian or Syrian ornamental figurines showing a woman and child. All are part of this same zoomorphic tradition, however. The camel [EA1984.31] is highly iridescent through burial in the ground, but appears to have been a blue and black design painted under glaze. It is a Bactrian, two-humped camel, common in Central Asia, rather than the single-humped Arabian dromedary. The load appears to consist of neat lengths of wood, carefully tied together in bundles. They could be part of a Turcoman, white felt tent (yurt) on the move, and the attractive possibility then arises of a set of ornamental camels each laden with the different parts of such a yurt. As common as complete animal forms for objects, was the use of human or animal heads for the mouths of jugs or ewers. The mouth of the jug (no. 21 [EA1978.1675]) is in human form, but could be the head of a sphinx. If so, it may well be designed to bring good luck to the owner, a role played by sphinxes throughout the early Islamic period. The inscription is illegible but would probably have suggested the repetitive good wishes commonly used to decorate early Islamic objects. E.C. 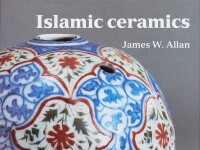 Dodd, On the origins of medieval Dinaderie: the equestrian statue in Islam, Art Bulletin vol. 51 (1969) pp.220 – 232. Presented by Lorna Yusof, 1984.